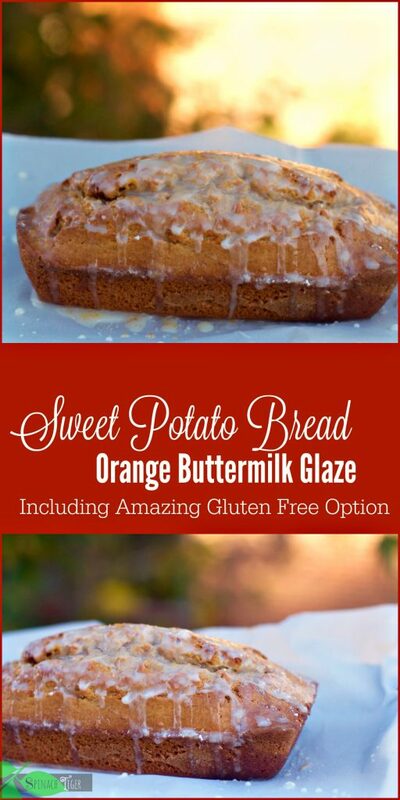 As soon as I saw this recipe for sweet potato bread, I got excited. It was in In case you’re not aware of Spinach Tiger’s love for sweet potato everything, just follow the link for my favorite sweet potato recipes below. First, though take a look at this sweet potato bread, and be sure to make it. There’s a gluten free option too which some thought was better than the regular. This may surprise you. I made two identical loaves of the sweet potato bread recipe and decided to do my own comparison using this gluten free flour. A blind taste test, the gluten free flour won! This is the first time I’ve made a cake (sweet bread) with gluten free flour. I’ve made biscuits, scones, pie crust and I have to tell you, it’s exciting to know that gluten free flour works so well in cakes. I’ve tested several flours and still stick with Bob’s Red Mill One to One. 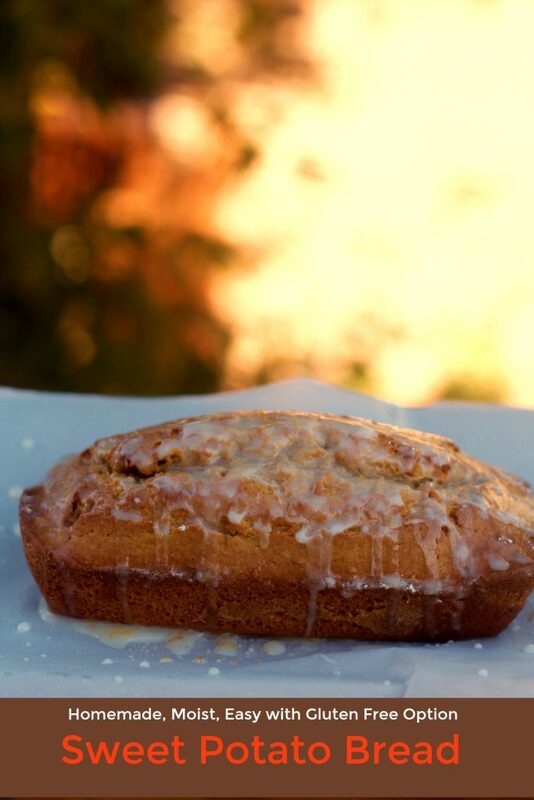 This Sweet Potato Bread Recipes is full of Fall flavor’s and very moist. You will taste the sweet potatoes and all of the spices. Both versions are very moist and last for several days. 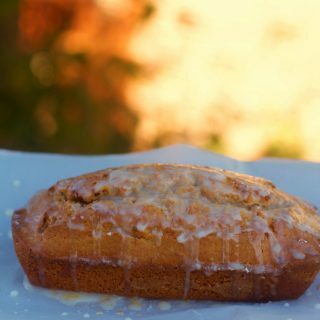 The original recipe used a lime glaze, but I wanted a more traditional orange glaze made with buttermilk. I used Happy Eggs, which are true free range eggs. Using good eggs makes a difference, especially when using the gluten free flour. 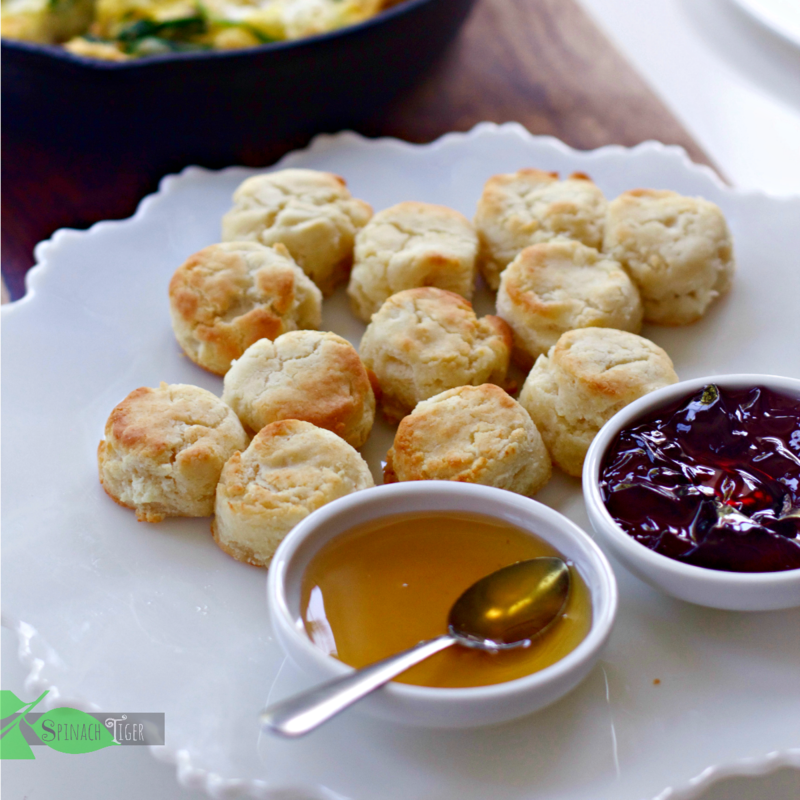 You must try the gluten free biscuits at Spinach Tiger. The comments will convince you. 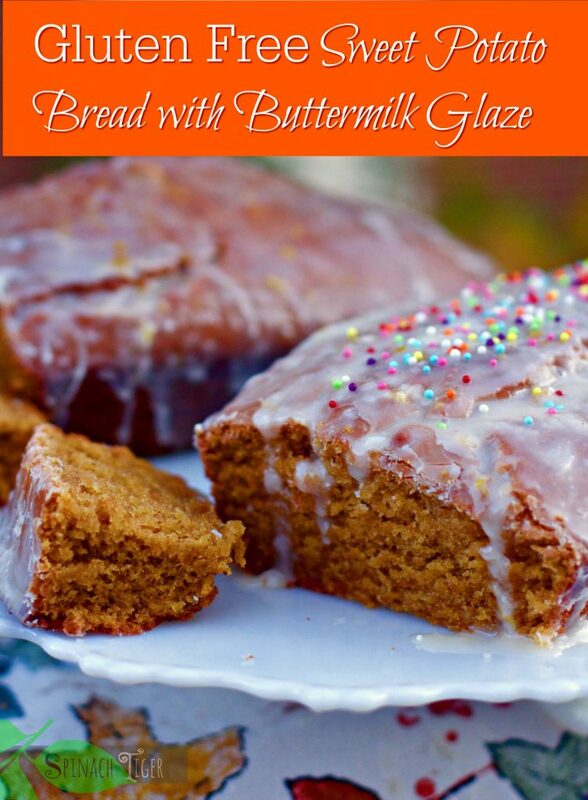 Sweet Potato Bread with Orange Glaze, great for breakfast or dessert. Preheat oven to 350. Grease a 9 inch loaf pan. Combine dry ingredients. Combine sweet potatoes, brown sugar, vanilla. Add eggs one at a time. Add wet ingredients slowly to dry ingredients, stirring constantly until well combined. Add batter to baking pans. Bake for 50-60 minutes, until tooth pick comes out clean. Immediately pour glaze while bread is still warm. Whisk all ingredients together until smooth. If too runny, add more sugar. If too thick add a few drops of buttermilk. 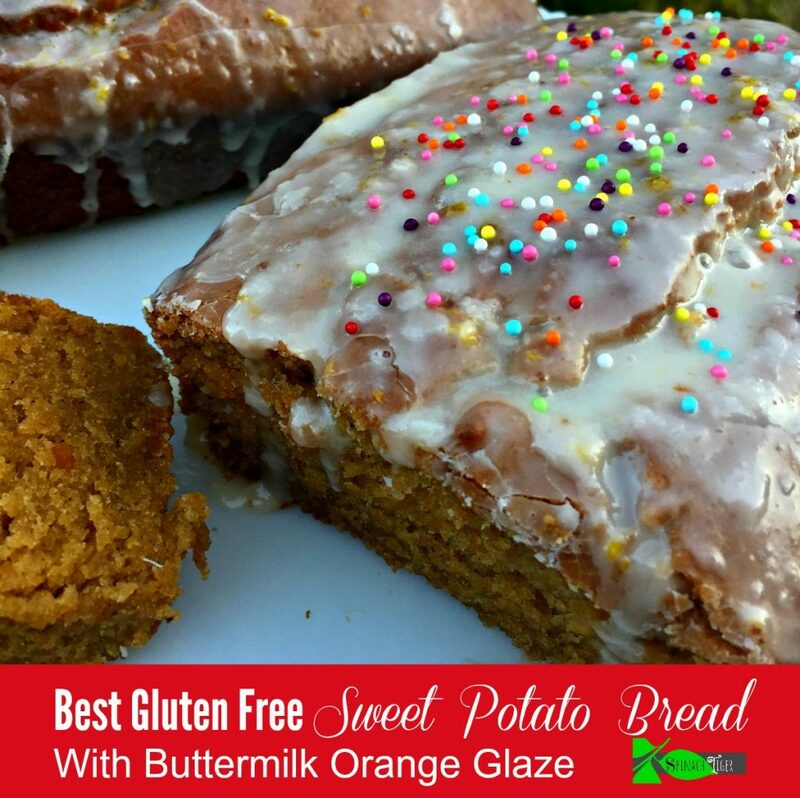 Gluten Free Sweet Potato Bread, moist and delicious. Great for breakfast or dessert. There are affiliate links on this page, which may earn a small commission. This aids in keeping this site running. Thank you. I just made the GF Sweet Potato Bread and it turned out great. A dense, yet somehow fluffy result and tastes like you might imagine autumn should taste – its yummy! I didn’t have any ground ginger so I compromised by using a spice mix I have on hand which includes ginger, cloves, black pepper, cassia, cardamon and nutmeg. I used this instead of the 1/2 teaspoon ground ginger and 1/8 teaspoon ground cloves and it was absolutely fine. My spice mix gave it a warm chai style flavour which was really lovely, but next time I will make sure to have the ginger and cloves because I know it will dial up the warmth and that deep spice taste which I know will be heavenly. I mixed all the dry ingredients together including the brown sugar – because I didn’t read ahead to see that the Brown sugar should have been mixed with the sweet potato and eggs and because the recipe just says combine all dry ingredients. Sugar being a dry ingredient just went in with the other dry ingredients, however it didn’t make any difference as far as a could tell. I added the sweet potato and eggs to the dry ingredients and was about to put it in the pan for the oven when I read through the recipe again and found I hadn’t added the coconut oil or the maple syrup as the recipe didn’t mention these in the instructions. My fault as I should have read it more thoroughly but an easy mistake too since it wasn’t mentioned. I quickly melted the coconut oil down since it had solidified in the cooler weather and added it along with the maple syrup to the batter, hoping it wouldn’t make a big difference to the overall end result due to it being added last like that. I also thought that it was a lot of oil so was a tiny bit worried that it would result in a very dense bread, but decided it’s all about experimenting anyway, mixed in 3/4 cup as per the recipe and put my pan in the oven. It definitely smelled heavenly while baking so after allowing it to cool I wanted to try it immediately. I wasn’t disappointed as it tasted so scrumptious! If I were to change anything, I’d probably not add the maple syrup as with all the brown sugar in the recipe I didn’t feel it was needed and the delicate maple flavour gets lost in the mix. I’d also probably reduce the amount of sugar to about 2 thirds, however I am not complaining and probably splitting hairs here as this recipe turned out so well. PS – you say,’as soon as you saw this recipe’, you got excited. Is this a recipe you found and modified ? This is absolutely DELICIOUS! I made a loaf the other day and it was gone within the day (my toddler nephew particularly LOVED IT)! I’m making it again today for Easter! Thank you for posting this!! I made the gluten-free option, by the way, and used Pamela’s Gluten-free baking flour. I have found Pamela’s to be the best gluten-free, all-purpose flour – even better than Bob’s Red Mill. However, I have actually met Bob from Bob’s Red Mill and he’s a really amazing person, so I still love to support him and his products!! Where can we find the gluten free option of this recipe..? Thanks so much!